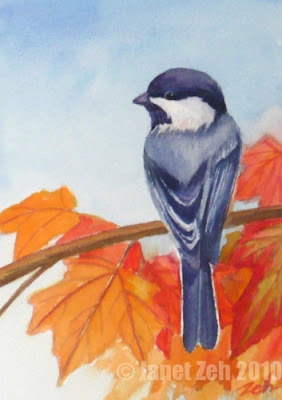 A little chickadee alights on a maple tree, it's leaves full of autumn color. He seems to be turning around to see who is looking at him. These tiny birds are very friendly and a favorite visitor to the bird feeder for many people. The original watercolor is sold. You might like to check out my bird paintings currently for sale in my Etsy shop. Or let me know if you'd like one painted just for you!